You may be wondering why we’ve not added ones for the Conservative Party and the UK Independence Party (UKIP). This is because none are yet available. Mencap is urging these parties to produce them on their website page General Election 2017 Easy Read Manifestos. They’ve also brought all the easy read ones together on the same page. We’ll update the post when ones become available. Finally the BBC have a web page General Election 2017: Manifesto Guide on Where the Parties Stand that will guide you to what the parties think on particular issues. Dreaming by Hartwig HKD is licensed under CC BY-ND 2.0. What do you think? Certainly education plays a large role in exploring those dreams: to widen participation and nurture ambition. We would add that books are resources at the heart of learning beyond the classroom. We highlight 8 women writers and activists this month on display in the LRC. These women are: Nawal al Sadaawi, Laura Bates, Chimamanda Ngozi Adichie, Maya Angelou, Amy Tan, Ursula Le Guin and Margaret Atwood. We hope to inspire students to read widely, to share their thoughts and experiences and to give support to other women and men so that everyone sees their potential. You may have noticed the BBC is currently running a season programmes on everything digital. 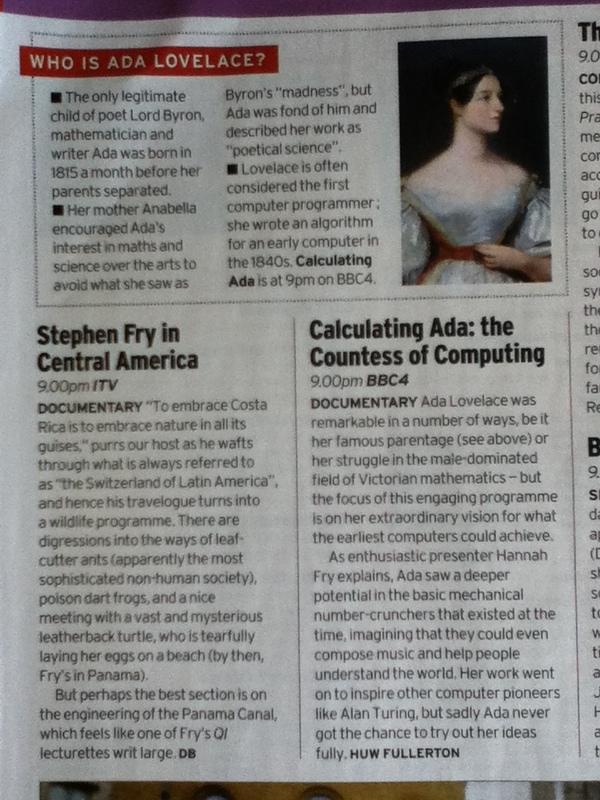 We’ve just added BBC4’s Calculating Ada: the Countess of Computing from the season to our collection. Ada Lovelace was Lord Byron’s daughter and her mother ensured Ada learnt about mathematics so as to separate her from her father’s literary legacy. Ada recognised the value of Charles Babbage’s Analytical Engine and tried to raise funds so it could progress. She published the first computer programme and influenced the work of Alan Turing. If you missed the programme you can catch up on BBC iPlayer. We’ve not recorded all of the programmes for our college but you can find out about other programmes on the BBC Make It Digital page. There you’ll find programmes about women programming, game makers and how algorithms work. Plus there’s a chance to vote on who you think is the biggest digital influencer.